No. 2 seed Angelique booked her spot into the Australian Open third round after a straight sets win over Brazil’s Beatriz Haddad Maia. Angie needed 81 minutes to record three breaks over Wang and claim the 6-2, 6-3 victory, moving into the Australian Open third round for the sixth time in her career. A 47-minute first set pivoted around two epic Haddad Maia service games – both of which provided opportunities for the Brazilian to show off the full range of her skillset – if not always for much scoreline reward. The first plunged Haddad Maia in at the deep end from the off with a seven-deuce tussle, and the World No.192 impressed in saving the first four break points in style: big forehand strikes followed by a delicate dropshot; a neatly put away volley; a firm smash. But Kerber was in indefatigable mood today, and the German was happy to dig in and continue to relentlessly out-manoeuvre her opponent in extended rallies – and on the fifth break point this paid off as Haddad Maia, out of ideas, essayed an ill-advised dropshot and sent it into the net. Four games later, the pair would wind up in an even more arduous dogfight, this time over the course of ten deuces. There was some payback for Haddad Maia, who bravely staved off six break points to hold for 2-4 – but this wasn’t enough to alter the flow of the set. In the face of Haddad Maia’s power and touch, Kerber had needed to be close to her best – and the three-time Grand Slam champion rose to the challenge. All of the drama was happening on the Haddad Maia serve – but in between, Kerber was simply taking care of business on her own delivery with maximum efficiency. The former World No.1 would concede a miserly three points on serve in the first set, and just ten overall; she would face only one break point, in the third game of the second set, which was immediately snuffed out with an unreturnable serve. Kerber is not renowned for the pace of her delivery – her fastest serve, at 167km/h, trailed her opponent’s by 17km/h – but she was able to hit her spots consistently and accurately to build carefully constructed points. Haddad Maia, who dropped serve for the second time to concede the first set, was able to keep pace with Kerber in the second as she avoided getting dragged into any extended tussles. But as the set progressed, it was Kerber who was increasingly probing at chances to take the lead, and in the eighth game the 2016 champion struck. Her trademark forehand down the line had been song all day, and it came through twice as the finishing touch to a pair of brilliantly crafted rallies that saw Kerber break for 5-3. And, having been rock solid on serve throughout, Kerber was subsequently able to close out the match to 15 with a minimum of fuss, winning a 25-shot rally on her first match point when a Haddad Maia forehand sailed wide. 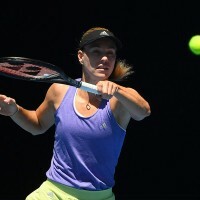 With two impressive wins under her belt, Kerber will now seek to move into her fourth consecutive second-week showing in Melbourne against 20-year-old local wildcard Kimberly Birrell, who had earlier shocked No.29 seed Donna Vekic 6-4, 4-6, 6-1.